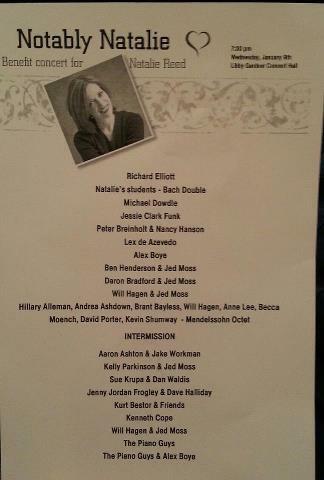 I went to a benefit concert last night for my friend, Natalie, who was diagnosed last month with stage 4 cancer. I’ve known Natalie for about 30 years. The news has rocked our book club. We all attended the concert together last night, willing our love Natalie’s way, as we listened to sublime music. Natalie was a violin teacher, extra ordinaire. She played in all the musical circles that create the music that surrounds us here in our mountain valleys and beyond. Many of the 20 performances by friends and loved ones were simply breath-taking. Some made me weep. As her violin students played exquisitely before a packed concert hall, I suddenly felt very small. I could see and feel and hear the electricity of what happens when you leave yourself behind, when you pass your gifts or talents on to another person, who magnifies that talent. It felt like sparks were flying, and had ignited all around me. I felt light and goodness in the room surrounding me. I felt everyone loving Natalie and willing her to feel that love. I felt her life expanded and multiplied until it filled the whole room. I felt small in that room, wondering about the influence I’ve had on others. Is my influence enough to fill a concert hall with light and warmth and love on a dark cold winter night? Am I finding ways to leave myself behind? When I go, will it have mattered that I was here? Let us get our instruments tightly strung and our melodies sweetly sung. Let us not die with our music still in us. Let us rather use this precious mortal probation to move confidently and gloriously upward toward the eternal life which God our Father gives to those who keep his commandments. I just read this post for the first time today about your friend Natalie and her diagnosis with stage 4 cancer. Interestingly enough I just heard a remarkable story of a woman who was diagnosed with stage 4 cancer and was not expected to survive through the night when she started using doTERRA essential oils. I thought you may want to pass it on to her. To listen please call (605) 475-6603 Access Code 659148# It will only be available via this number for 30 days. Please forward to everyone you know! This can help so many people suffering from this terrible disease! Thanks so much! Prayers are going out to your friend Natalie.